Matt 14:20 Jesus fed the 5000 and they were satisfied. What can I learn from this passage? Jesus had compassion on the families who desired to know Him better, to learn from Him, and to be healed. He satisfied their needs. As a child of the King, he loves me, too, and will satisfy all my needs...warped relationship with food, and all. 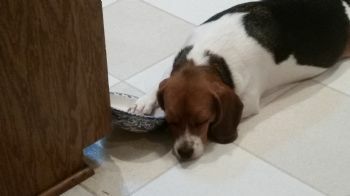 Just as Dixiana waits by her bowl to be fed, I can trust that He will take care of me.